Vietnam has one of the most confusing tourist visa systems in Southeast Asia—and recent attempts to make things easier have in fact only added more complexity. 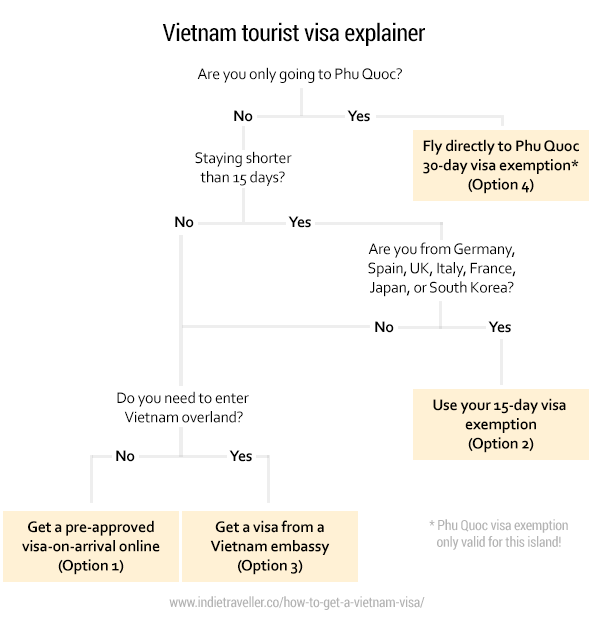 If you’re unsure how the Vietnam visa system actually works, let me try to clear things up for you. Below are all of the tourist visa options for Vietnam. Simply follow the flowchart to find out the best option for you, or read on for all the nitty-gritty details. 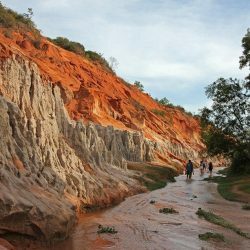 While most visitors from Western countries can usually just show up and get a visa-on-arrival at the borders of Laos, Cambodia, Thailand, and many other countries, it’s not always so simple with Vietnam. You may well have to get a pre-approved visa, and your visa options will also depend on whether you’re flying into Vietnam or intending to cross a land border. IMPORTANT: you still need to get pre-approved for this before going to Vietnam! You can ONLY use this if you fly directly into Ho Chi Minh City, Hanoi, Da Nang, or Nha Trang. NOT for land borders! Getting a visa-on-arrival is the easiest way to get a visa if you are flying into Vietnam. You have to submit an application online, which then gets approved within a couple of working days. Once approved, you can fly to Vietnam and show your paperwork at the airport at immigration, after which you’ll get your visa stamp in your passport. You can’t submit your application for this directly to the Vietnam government; instead, you fill out an application online via a recognized 3rd party agency. Many of these agencies have outdated websites seemingly designed in the 1990s, so it can be difficult to know which one to trust. 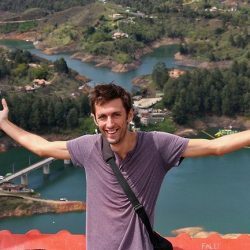 I’ve personally used Vietnam-Visa.com which has a modern site with a smooth process, and transparent visa information based on your nationality. First, you submit an application via this agency (I recommend Vietnam-Visa.com). You can choose either a single-entry or multi-entry visa, and go for either 1 month or 3 months. You can the agency a fee for their work (currently between $14 and $33). Once approved, you fly to Vietnam, you show your papers at airport immigration, and you’ll get stamped. Keep in mind you still have to pay $25 at the border for the visa itself (the service fee you already paid is just a processing fee for the agent). The visa exemption program was recently introduced to give tourists from specific countries an easier option for entering Vietnam. It’s a pilot program that might be expanded in the future. With this option, all you have to do is show up at the border, no prior approval needed. You may be asked to show proof of onward travel, such as your return flight ticket out of Vietnam. And if you need a longer maximum stay, you should go for a different visa option. This is the traditional way of getting a visa for Vietnam. Alternatively, if you are already traveling through Southeast Asia, you could visit the Vietnam embassy in a nearby country. For example, you could get your visa in Vientiane, Laos or in Phnom Penh, Cambodia. In these cities, you can often also find 3rd party agencies that will take care of the paperwork on your behalf. You’ll need 2 passport photos and you’ll also need to fill out an application form. Once approved (this can take a few days) a visa paper will be stapled or glued onto a page in your passport. I once did this in Vientiane and had to wait 4 days for my passport with visa to be delivered. The cost is either $25 or $50 depending on which type of visa you request. These are the most flexible visas as they can be single or multi-entry, up to 3 months, and can be used at airports or land borders. Do read the section below regarding entry dates. If you ONLY plan to visit Phu Quoc island in Vietnam, you can make use of the Phu Quoc island visa exemption. You can stay for up to 30 days without a visa. All you have to do is either fly directly to Phu Quoc airport or fly to another international airport and directly transfer to Phu Quoc. Vietnam is trying to develop Phu Quoc as a special tourism zone, with the hopes of one day turning it into a resort island similar to Phuket in Thailand. That’s why it has a special visa. You can’t travel anywhere else in Vietnam when using this exemption. Important: check your arrival date! One last thing: make sure you consider your arrival date carefully! Your visa does NOT start from the date you enter Vietnam. It starts from the date you specify in your application. 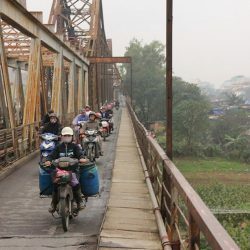 This is not such a big deal if you’re going on a holiday only to Vietnam, but it’s a real pain for backpackers who are traveling around the region and who might like to improvise instead of planning everything in advance. Example: suppose you have a 30-day Vietnam visa with a start date of February 1. Except… you’re having so much fun traveling in Laos that you change your plans and stay in Laos for a while longer. You end up crossing the border to Vietnam only by February 15. This means you now only have 15 days left on your Vietnam visa, NOT 30 days. If you are traveling long-term and like to have some flexibility then be sure to pick your entry date wisely, OR pick up a visa from an embassy while you’re traveling, OR get a 3-month visa so you have a generous window within which you can enter Vietnam. P.S. Don’t miss my tips for what to see and do in Vietnam. Thanks for the interesting information! 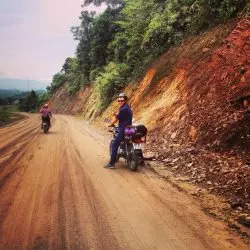 I will travel overland from Laos to Vietnam. I was wondering if you ever crossed the border from Laos to Vietnam? So If I am correct you have an embassy at Vientiane and a consulate at LP. Are both options more or less the same? So you had to wait 4 days, can you pickup your VISA later or do you have to be in LP the exact date they arranged your visa? I would otherwise apply for a VISA at Vientiane/LR and then travel to Vang Vieng/Luang Nathma if I have to wait for some days. Is this possible? I once picked up my visa in Vientiane, then had to wait several days, and then resumed my trip. You can travel during your waiting time and, as far as I know, you don’t need to pick up your visa on the exact date it’s issued. (However, you have to specify a start date for Vietnam, from which the visa will be valid.) So yes, you can make use of the time between requesting and picking up the visa. Not sure what the visa process is from LP. Hi I appreciated the info on your website. Currently wanting to spend a month backpacking around Vietnam CHEAP. Does anybody ever just hike through the country or do they take trains/buses for time sake? Also I must have missed the info on the less than positive attitudes from locals at times. It doesn’t get more official than the Vietnam embassy so yes I’d say so. 90-day visas are going to be more expensive than 30-day ones. There is an easier way to get online visa for foreigners instead of doing the visa-on-arrival letter thing. 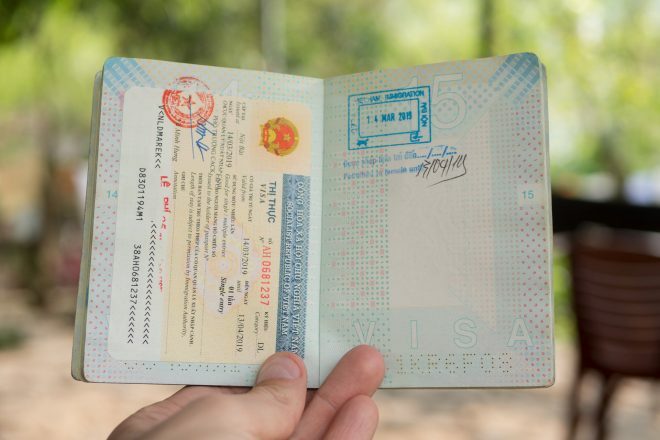 On https://www.immigration.gov.vn/ you can apply directly with the Vietnamese government and after 3-5 working days and paying 25 USD you’ll be issued with a paper confirming your visa that you need to print out, and at immigration you simply go straight to the immigration gate, show them the paper, they’ll stamp your passport and you’re in. It is single-entry and 30 days only though. I’ve found it because my country’s (Czech Republic) official foreign ministry website started pointing to it earlier this year and have tried it 3 times without any issues. It’s similar to the VoA letter except you can pay in advance (so no issues with not having 25 USD on hand at arrival), it’s a bit cheaper and just generally more convenient. Hi! This is so helpful. 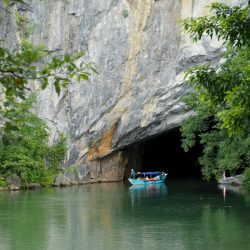 I am from the UK is it possible to do Vietnam in 15 for option 3, or do you recommend longer? I am doing the full SE Asia tour so am a bit cautious of selecting dates. And would I need a flight in, and then a flight out for proof or would bus be OK? Sorry for the million questions, thank you! Ps. 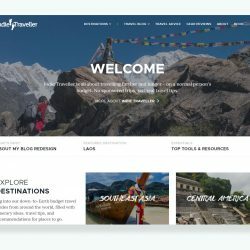 your website is amazing! Hey Olivia! A bus ticket out should work just fine. It’s not that common for them to ask about your onward travel, but you could book something just to be safe.